The DEWE2-PA7 Power Analyzer for Power Analysis is the complete solution for analysis of multi-phase electric vehicles and engine behavior with only ONE instrument. Do you have Power Analysis needs? 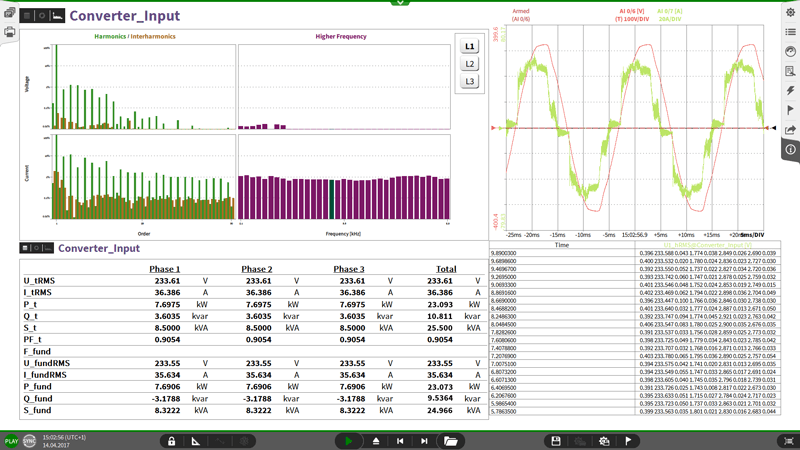 Are you curious about in the Power Analyzer DEWE2-PA7? We are eager to give you a demonstration of all the benefits. Or contact us if you have further questions. A DEWETRON DEWE2-PA7 is the solution for the simultaneous analysis of several motors, converters or complete drive trains. 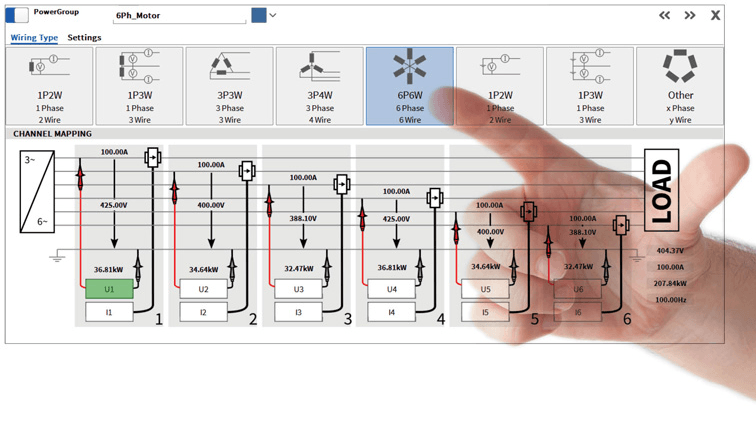 Up to 12 power channels and calculation of power parameters even for polyphase motors (from 1 to 9 phases) turn the DEWE2-PA7 into a multi power analyzer. Waveform data, mixed signal and power analysis? Reliable gapless recording of any analog or digital signal. High performance power calculation of several power groups simultaneously. Up to 2 MS/s/ch and high dynamic range guarantee data integrity. Smart interface technology makes it easy to integrate a DEWE2-PA7 into automation systems and test bed environments. Further, it guarantees reliable data transmission, easy to use remote control and remote configuration through TCP/IP based protocols and file formats. Protocols are in compliance with standardized protocols such as ASAM. 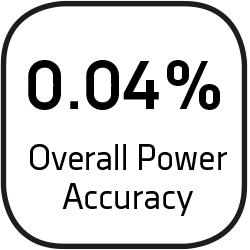 Dedicated measurement displays with classic design provide critical data values at a glance. 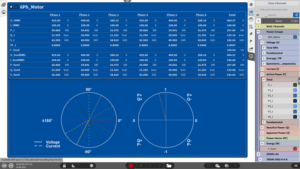 A predefined measurement display for each user defined group of power channels presents an overview table, vector scope and harmonic chart. Different styling presets and data presentation tools are available to tailor the display to your exclusive needs. Analysis of harmonics, interharmonics and higher frequencies as well as voltage fluctuations and flicker emissions are done according to industry standard. The 9” high resolution display is very bright for maximum readability and ample space for user defined screens. Also the few necessary settings are easily accessed with just a few swipes on the multi-touch display. Accessible and orderly arrangement of signal inputs and power parameters directly on the front. Everything at a glance! The integrated transducer power supply enables the engineer to relinquish an additional supply box and connect the transducers directly to the DEWE2-PA7. Most of the common sensors with ±15 V or +9 V are compatible, also demanding ones (like zero-flux transducers) can be powered thanks to the superior power supply. All DEWE2-PA7 systems are optional supplied with an EN ISO/IEC17025 certification. Calibration and adjustment are done in the accredited calibration lab at the DEWETRON headquarters. OXYGEN with Power option seamlessly integrates data being transmitted through multiple, totally synchronized signals into calculations for power analysis. Precision Power Analyzers are used to ensure and prove the reliability, failure safety and efficiency of the energy supply/distribution and backup solutions in a data center. With this purpose in mind, the ultimate objective is to keep or raise the failsafe performance and to reduce the PUE! Why is this important? Generally, an increase of the fail safe performance is an extremely good selling point! On the other hand, a lower PUE is a guarantee for highly efficient SUB-Systems. The energy consumption of SUB-Systems, like power distribution, lightening, cooling and power backup is approximately 50% of the total energy consumption. For example, approximately 33% of the total energy consumption is used for cooling. Up to 65% of “cooling energy” is wasted and can be not used for cooling servers. A small optimization of the grey space (2.5%) leads to an additional turnover/profit of up to 0.83 Mio. EURO (or 6.8 Million kWh) for the Data Center per year! Additionally, a DEWETRON Power Analyzer helps to locate energy wastes and reduces energy consumption, therefore increasing of the efficiency of the entire Data Center. 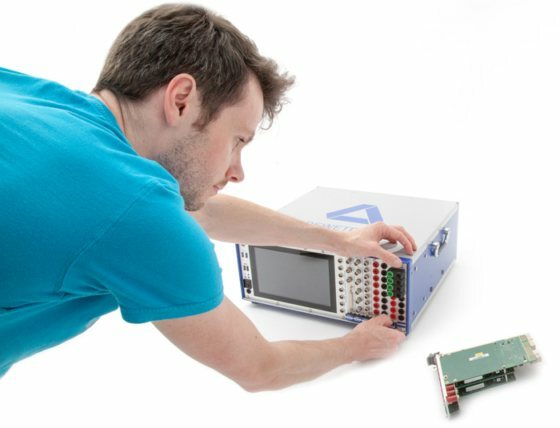 With a precision power analyzer it’s possible to replace or combine at least 3 legacy measurement instruments (Power Quality Analyzer, Power Meter, Recorder, Power Scope, …) with a single device. This creates a common database (“single point of truth”), uses a single powerful Software Solution for Measurement and Analysis (the use of additional analysis tools is no longer necessary, reducing the cost of licenses by approx. 8000 EUR per year). The resulting reduction in required resources allows these resources to be re-applied elsewhere (reducing the number of Power Analyzer/DAQ Systems, reducing training effort/expenses, and reducing the cost of calibration and maintenance). Overall a DEWETRON Power Analyzer leads to saving of approx. 0.9 Mio. EUR per year!